In most cases, the world is fair. Most reports focus on outstanding special applications and dedicated machinery specially designed for such purposes, while standard machines are not in the limelight, yet have the lion’s share in contributing to corporate success. This also applies to plastics processing in general, and injection molding machines in particular. This report is dedicated to such machines and their positive features. They operate at the motorcycle parts manufacturer J. D. von Hagen AG in Iserlohn, North Rhine-Westphalia, and have come from Wittmann Battenfeld. Among other things, they produce a diversified range of encasement parts and luggage management systems for motorcycles. Wittmann robots and Battenfeld AIRMOULD® gas injection equipment complement them and extend their scope. A touch of admiration accompanies our conversation with Martin von Hagen, Chairman and CEO of the Westphalian company J. D. von Hagen in Iserlohn. We are impressed not only by the candid dialogue, but first and foremost by the fact that he is the fifth-generation representative of the family who heads this enterprise. How many companies are can boast such a degree of continuity? In 1885, the locksmith Johann Dietrich von Hagen laid the foundation by establishing a lock and metal goods factory. Until 1957, the company processed exclusively metal into stamped and bent components as well as locks, primarily for the production of bags and suitcases. But then the era of plastics began at von Hagen, with the main focus of its business activities consistently remaining on suitcases and travel bags, whether in the form of components or as finished products. Even though the first plastic parts were not suitcase components, but vacuum-thermoformed parts in the form of cutlery trays for the furniture industry. But the next subcontracts which followed brought the company back to its original line. They were for topcases for a well-known Italian scooter brand. This marked the beginning of a business segment which is the mainstay of the company’s business today. But since this company was still a lock manufacturer, too, and locks with accessories in adequate quality were needed for motorcycle cases, replacing die cast zinc with plastics became an issue from 1987 onwards. As a logical consequence, the company entered into injection molding and mold making. For the family-owned company, it was just as logical to rely on cooperation with a regional partner when entering a new technology. 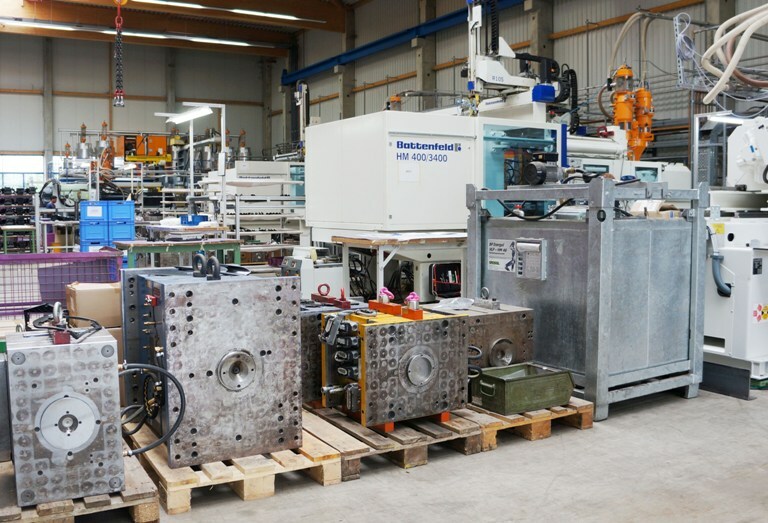 Here, Battenfeld Kunststoffmaschinen GmbH, based in Meinerzhagen at a distance of some 50 km and already one of the leading companies in the industry at that time, was the obvious choice. The beginning was made with a CD 750/315 with 75 t clamping force, supplied by the Austrian facility, followed by a BA-T 1600/1000, a toggle machine with 160 t clamping force from Meinerzhagen. Once the company had familiarized itself with the possibilities of injection molding, the market potential for top-quality suitcases opened up, but also the entry into the production of other motorcycle and automotive components. Today, J.D. von Hagen is the system partner of all major cycle manufacturers for cases and encasement components, with BMW being the most prominent customer (fig.1 and fig. 2). Today, 13 of the 18 injection molding machines installed at J.D. von Hagen, with clamping forces ranging from 60 to 1,600 t, have come from Battenfeld or Wittmann Battenfeld (fig.3). All machines are standard models, i.e. with standard injection and clamping units. The machines from the HM series are the backbone of J.D. von Hagen’s production. They are available with a hydraulic 3-platen clamping unit in the 35 to 300 t clamping force range, and from 400 to 650 t clamping force with a 2-platen clamping unit. What both versions have in common is their extremely compact clamping units. This applies in particular to the 2-platen version, which keeps its footprint extremely small thanks to an overlapping configuration of the clamping cylinders and the injection unit (Fig.4). Characteristic features are the generously dimensioned mold space and the platen support with highly accurate linear guides. The tie-bars have no guiding function, they are freely retractable in the fixed platen and merely serve as force transmitters. Thanks to the platen support on the linear guides, the guiding precision is maintained unchanged even with additional loads due to heavy molds. The linear guides and the retractable tie-bars mounted on the moving platen are also characteristics of the 3-platen HM machine models.All in all, this provides optimal conditions for precision in the interaction with the greatly varying mold sizes, which are a given on von Hagen‘s production floor. As the numbers of units per order in motorcycle components are below those in automobile components by a factor between 10 and 100, an elaborate system of parts logistics, adequate reserve inventory capacity, flexibility and technical facilities to shorten set-up times are a must. Just a few figures for illustration: typical order quantities per model and year are about 12,000 units, or 5,000 units per model variant. These quantities are divided into 12 delivery lots, which corresponds to released quantities between 400 and 1000 units per month. But again and again, special customized models produced in quantities of less than 100 units must be produced in between. Handling this type of program in injection molding production requires user-friendly standard machines, as described above, with regard to the electronic control system as well as easy access to the clamping unit, and also a just as user-friendly and flexible quick mold clamping system. Accordingly, the majority of the injection molding machines has been fitted with a magnetic mold clamping system from EAS (fig.5). For parts removal, J.D. von Hagen also relies on the excellent performance of the standard linear robots from Wittmann. On the mid-range machines, the UNIROB R10S and R20S linear robots have been in operation for many years; the latest machine is equipped with a latest-generation W 823 servo robot. Suitcases need handles and stiffening profiles incorporated in the shell. To form these with a rounded cross-section which is gentle to the hand and simultaneously be able to produce them within economically feasible cycle times, J.D. von Hagen relies on AIRMOULD® gas injection technology from Battenfeld. Two compressor units combined with nitrogen generators supply several machines. The appropriate mold technology for gas injection molding is produced in-house. Generally, the great depth of production and know-how is one of the most impressive characteristics of J.D. von Hagen. According to the company’s own figures it accounts for roughly 74 per cent of the sales figure, a comparatively rare value, but probably the basis for the automotive and motorcycle subcontractor‘s flexibility.It ranges from component development, metal part production and plastic injection molding all the way to spray-painting and component assembly.